With the weather finally cooling down over here on the west coast it’s high time to break out the sweaters and soups alike. After all, it just isn’t really fall until you’ve made your first pot of soup at home. The type of soup that fills the entire house with the fragrance of warmth and autumn that lingers on until holiday cookies start making an appearance. 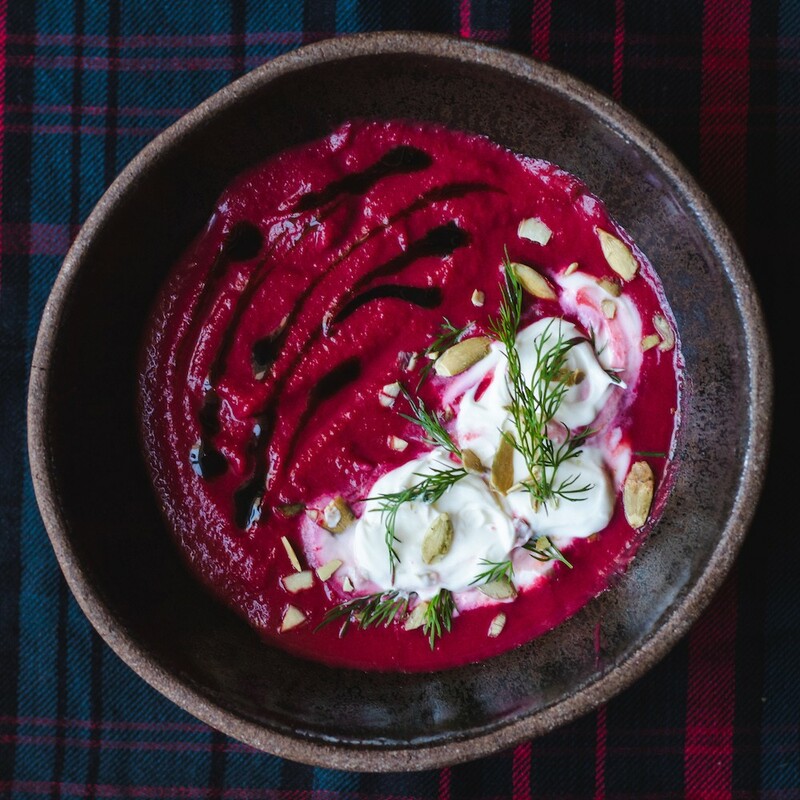 So we will gladly enjoy the crisp chill in the air and cozy up with a bowl of this delicious balsamic roasted beet soup. This thick and creamy mixture is sure to be a delightful addition to your Sunday dinners and Thanksgiving table alike! Since we know it’s all about the presentation we garnished our soup with an additional little dollop of creme fraiche, a drizzle of MiaBella balsamic, fresh dill, and some pumpkin seeds for a little crunch. This soup has such a vibrant red color that any fresh greens will look fantastic on top and just add that little extra! Pair with a glass of Sancerre and you’ve got a wonderful starter or a main attraction. 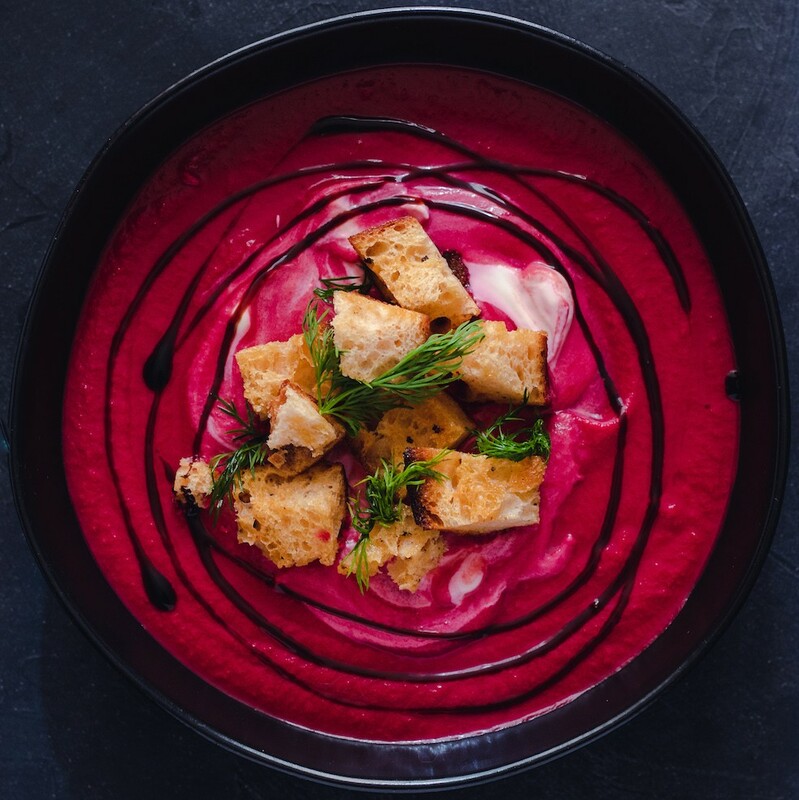 Not only is this soup delicious and looks fantastic on any dinner table but we are also blown away by our main ingredient, beets! Beets are overflowing with nutrients including Vitamin C, potassium, magnesium, folate, and more. They also contain 0 fat and boast a good amount of dietary fiber. All that being said beets is not exactly an easy food to introduce into your diet...until now. So go ahead and don your sweater and enjoy a hearty delicious bowl of balsamic roasted beet soup. Preheat oven to 400 degrees. In a medium bowl combine 1/3 cup olive oil, MiaBella Traditional Balsamic Vinegar, sugar, and salt. Add the beets and carrots to the MiaBella mixture and let marinate for 5 to 10 minutes, toss the combo once halfway through. 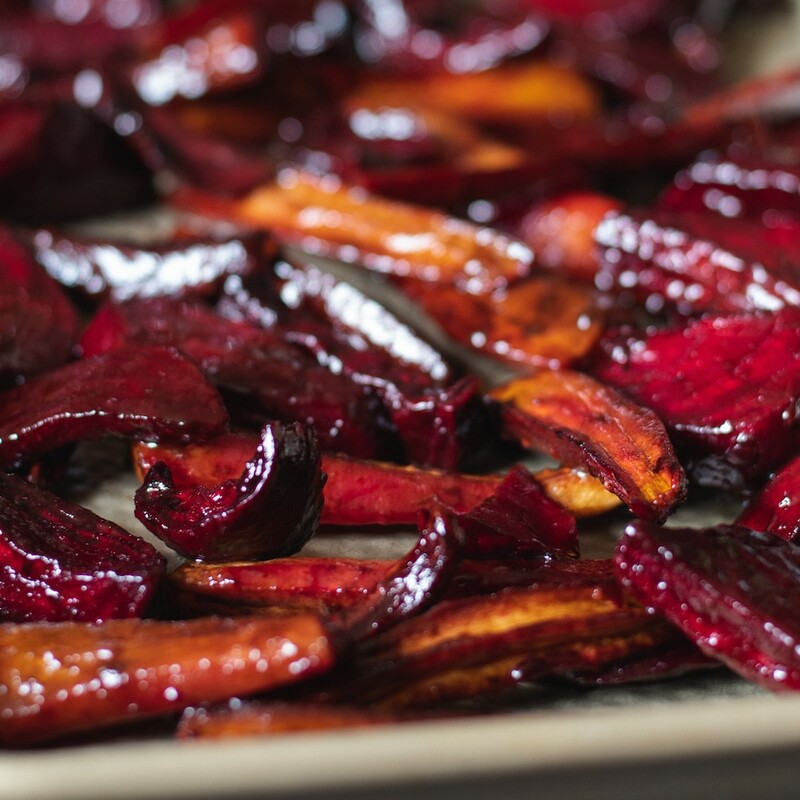 Remove the Beets and Carrots from the mixture and spread evenly onto a lined baking sheet. Bake for 1 hour or until the beets are caramelized and browned. During the last 15 minutes of baking time for the Beets & Carrots, heat 1 tbsp olive oil in a large pot. Once the oil is shiny add onions to the pot and cook on medium low until the onions start to brown, about 10 minutes. Add the vegetable stock and water to the pot and bring to a simmer. As soon as the beets and carrots have finished roasting add them to the pot. Let the soup mixture simmer for about 15 minutes. Remove the pot from heat and label the mixture into a blender. If you have an immersion blend then just blend away in the pot! Puree the soup until it is smooth and creamy. The finished product will be thick if it’s too thick for your liking you can add in more vegetable stock a 1/2 cup at a time until the desired density is reached. Add 1/2 cup creme fraiche to the mixture and stir to combine. Soup is ready to serve, garnish with MiaBella Balsamic and enjoy!